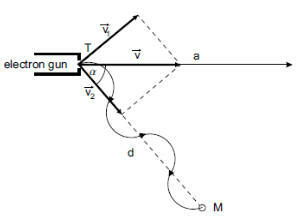 An electron gun T emits electrons accelerated by a potential difference U in a vacuum in the direction of the line a as shown in the figure below. 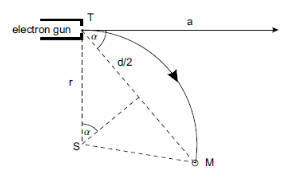 The target M is placed at a distance d from the electron gun in such a way that the line segment connecting the points T and M and the line a subtend the angle α as shown in figure. U = 1000 V, α = 60o, d = 5.0 cm, B < 0.030 T.
A charged particle moving in a magnetic field is acted on by a force F = qv × B. (a) If a uniform magnetic field is perpendicular to the initial direction of motion of an electron beam, the electrons will be deflected by a force that is always perpendicular to their velocity and to the magnetic field. Consequently, the beam will be deflected into a circular trajectory. The origin of the centripetal force is the Lorentz force, so Bqev = mev2/r. The velocity of electrons can be determined from ½mev2 = qeU. Substituting yields B = me(2qeU/me)½(2sin α/(qed)) = 2(2meU/qe)½sin α/d. Substituting the given values we have B = 3.7*10-3 T.
(b) If a uniform magnetic field is neither perpendicular nor parallel to the initial direction of motion of an electron beam, the electrons will be deflected into a helical trajectory. The motion of electrons will be composed of uniform circular motion in the plane perpendicular to the magnetic field and of a uniform rectilinear motion in the direction of the magnetic field. The component v1 of the initial velocity v which is perpendicular to the magnetic field will rotate uniformly around the line parallel to the magnetic field. The component v2 parallel to the magnetic field will remain constant. v1 = v sinα, v2 = v cosα. Hence we can calculate the radius of the circular trajectory r = d sinα/(2πN cosα). The Lorentz force must be equated to the centripetal force. Bqev sinα = mev2 sin2α/r = 2πN mev2 sinα cosα)/d. B = 2πN mev cosα)/(d qe). Numerically we get B = N*6.7*10-3 T.
If B < 0.030 T, then we have four possibilities, N = 1, 2, 3, 4. B1 = 6.7*10-3 T. B2 = 13.4*10-3 T. B3 = 20.1*10-3 T. B4 = 26.8*10-3 T.
The magnetic force on a point charge q moving with velocity v is F = q(v × B). Treat the moving charge as a current element. B(r) = (μ0/4π) Idl × (r-r')/|r-r'|3. For charge q' moving at a velocity v' we have Idl = q'v'. F = (μ0/4π) qq'(v × v' × (r-r')/|r-r'|3). A particle with mass M and charge q > 0 moves in a uniform magnetic field B and also in the field of another charge Q < 0 located at the origin. At t = 0 the particle is at x = z = 0, y = a, and its velocity is v0i. For what B will the trajectory of the particle be a circle of radius a centered at the origin? The Lorentz force, F = q(E + v x B) provides the centripetal force required for a circular orbit. Consider the geometry shown in the figure below. Let B = Bk. Mv02/a = keq|Q|/a2 + qv0B, B = Mv0/qa - ke|Q|/v0a2. A current I is flowing in the metal strip of width L and thickness d shown above. The metal contains ne free electrons per unit volume. A magnetic field B penetrates the strip as shown. In terms of I, B, ne, and L, find the potential difference between side 1 and side 2. ∆V = V2 - V2 = EHL = vdBL. This is known as the Hall potential. If positive charges were moving in the strip, they would drift towards side 1 and the sign of the Hall potential would change. where ne is the number of free electrons per unit volume. The current I equals the number of electrons that pass any point along the wire per second times the unit of charge e. <v-> = vd is the drift speed of the electrons. It is their average speed, as they move along the wire. We have vd = I/neeA = I/neeLδ. ∆V = IB/neeδ. Consider an idealized ion beam of radius R and length much longer than R.
Show that an individual ion at the periphery of this beam is subject to the net outward force F = (1/(4πε0))(2Iq/Rv)(1 - v2/c2) where I is the beam current, q is the charge of each ion, and v is the velocity of the ions. Assume that the charge and current densities have cylindrical symmetry. Because of the cylindrical symmetry we can find the electric and magnetic fields from Gauss' law and Ampere's law, respectively. We can then find the force F = q(E + v x B) on an individual particle with charge q.
Gauss' law: At r = R we have 2πRE = I/(vε0), E = I/(2πε0Rv). Ampere's law: At r = R we have 2πRB = μ0I = I/(ε0c2), B = I/(2πRε0c2). If the current flows in the z-direction then E points into the r direction and B points into the Φ direction. F = qI/(2πε0Rv) - qIv/(2πRε0c2) = qI/(2πε0Rv)(1 - v2/c2) = (1/(4πε0))(2Iq/Rv)(1 - v2/c2). The force points in the r direction and has magnitude F = (1/(4πε0))(2Iq/Rv)(1 - v2/c2). Two particles have equal mass m and opposite electric charge +q and -q, and are embedded in a uniform magnetic field B that is perpendicular to the line connecting the charges. The particles are initially held at rest, then are released simultaneously. (a) Find the force on each particle. (b) Find the minimum initial separation L that will not result in a collision after release. You can neglect gravitational effects. The particles interact via the electrostatic force, and if they are moving they are acted on by the magnetic force. The force on each particle is given by F = q(E + v x B). (a) Place the positive charge on the x-axis at x = L/2 and the negative charge on the x-axis at x = -L/2. Let the magnetic field point in the z-direction. The vector force acting on the negative charge is the mirror image of the vector force acting on the positive charge when reflected through the x = 0 plane, and the trajectory of the negative charge is the mirror image of the trajectory of the positive charge. Force on the positive charge: Fx = -kq2/(4x2) + qvyB, Fy = -qvxB. (b) The minimum initial separation L that allows the particles not to collide will result in the particles traveling parallel to each other in the y-direction with constant speed. The electric and magnetic forces acting on each particle then add to zero. Let us use SI units. Let k = 1/(4πε0). This yields ax = -kq2/(4mx2) + qvyB/m, ay = -qvxB/m. For a particle starting at rest at x0 = L/2 we have ∫0vydv'y = -(qB/m) ∫x0x dx'. vy = (qB/m)(x0 - x). Therefore ax = (qB/m)2(x0 - x) - kq2/(4mx2). ½m(vx2 + vy2) = ½kq2(1/(2x) - 1/(2x0)). vx2 + vy2 = [kq2/(2m)](1/x - 1/x0)). vx2 + (qB/m)2(x0 - x)2 = [kq2/(2m)](1/x - 1/x0)). For the particle not to collide at the minimum distance we need ax = vx = 0 for some x > 0. Combining equations (i) and (ii) yields kq2/(4mx2) = kq2/(2mxx0), or x0 = 2x. Inserting x0 = 2x into either equation (i) or (ii) yields x = (km/(4B2))(1/3). Therefore x0 = 2(km/(4B2))(1/3), L = 4(km/(4B2))(1/3). Two long straight parallel wires carrying the same current I and separated by a distance r exert a force of magnitude F on each other. The current is increased to 4I and the separation is reduced to r/6 . What will be the force between two wires? We are asked to find the force between parallel current carrying wires. From Ampere's law and F = Il × B we find the magnitude force (per unit length) between two parallel current-carrying wires separated by a distance r.
F = μ0I1I2/(2πr). Here I1 = I2 = I, so F = μ0I2/(2πr). Fnew = F = μ0 16 2/(2πr/6) = 96 μ0I2/(2πr) = 96 F.
A wire having a mass per unit length of 0.5 g/cm carries a 2 A current horizontally to the south. What are the direction and magnitude of the minimum magnetic field needed to lift this wire vertically upward? We are to determine the minimum magnetic field needed to produce a force F = -mg.
Orient your coordinate system so that the x-axis points towards the south and the z-axis points upward. We want the direction of the magnetic force F= IL x B on the wire segment to be upward and the magnitude to be equal to mg. To get the maximum F for the minimum B, B hat to point into the y-direction. Then F = ILB. B = mg/(IL) = ρLg/(IL) = ρg/I = (0.05 kg/m)(9.8 m/s2)/(2 A) = 0.245 T.
We need B = 0.245 Tj. B points eastward. A circuit contains two long straight wires laid out on a horizontal surface and an ideal source of emf ε, all fixed in place. A straight wire of length l is symmetrically placed on the wires as shown and initially held in place. The resistance of a unit length of all wires is λ. The mass of the wire of length l is m. The angle θ is given. The circuit is placed in a uniform magnetic field B directed into the page and the wire of length l is released. Neglecting friction and the induced emf, find the maximum speed of the wire after it is released. Choose a coordinate system with the x-axis pointing towards the right and the origin where the long straight wires come together. Then the horizontal position of the wire of length l at t = 0 is x0 = l sinθ. When a current flows through the wire of length l, a force pointing to the right will act on it. If it is free to move, it will accelerate towards the right. It will lose contact with the rails when its horizontal position is x1 = (l/2)tanθ and stop accelerating. Let 0 < θ < 90o. R = λ(2/cosθ + 2/sinθ)x = C1x. C1 = λ(2/cosθ + 2/sinθ) = constant. The current flowing is I = ε/R = C2/x. C2 = ε/C1 = constant. The magnitude of the force on the wire is I(2x cosθ)B = C22 cosθ B = constant. The acceleration of the wire is constant, a = C3 = (εB/λ)cos2θsinθ/(cosθ + sinθ). Kinematics: vmax2 = 2ax1 = (lεB/λ)cosθsin2θ/(cosθ + sinθ). An infinitely long solenoid is wound with one layer of very fine wire. The solenoid has a radius r meters, has n turns per meter of length, and carries a current I. (a) What is the magnetic field inside the solenoid? (b) What is the magnitude of force on a short length dl of wire in a turn, and what is its direction? (c) What is the tension in the wire? The problem has enough symmetry to let us calculate B from Ampere's law alone. If the axis of the coil is the z-axis and the currents flow in the φ-direction, then B = Bzk, Bz = μ0In inside the coil and B = 0 outside the coil. The current in the wires may be treated as a surface current with surface current density k. The field very close to a section of surface with current density k may be decomposed into the field B1 produced by the section itself and the field B2 produced by all other surrounding sections. The force per unit length on each wire can be found by from F= IL x B2. (a) The magnetic field inside the solenoid is B = Bzk, Bz = μ0In. (b) Consider a closed loop of length L enclosing N wires of the coil as shown. The current flowing through the loop is NI, and very near the wires this current NI produces the same B1 field as a surface current with density k = NI/L flowing in the same direction in a flat surface. Ampere's law yields B1 = μ0NI/2L = μ0In/2 pointing into the z direction on the inside and into the -z direction on the outside of the coil. So the field near the N wires that is produced by currents not flowing in the vicinity of the loop is B2 = μ0In/2 k. From F = ILxB2 we now find the force per unit length F/L = μ0I2n/2 pointing in the positive r direction. U = (1/(2μ0))B2A = (1/(2μ0))(μ0In)2A = I2n2μ0πR2/2. If dR is positive, then the battery does positive work. dW/dt = -dWext/dt = dU/dt = I2n2μ0πRdR/dt. dW/dt = 2πRfr∙v = 2πRfrdR/dt. Therefore 2πRfr = I2n2μ0πR. The force per unit length along the circumference fr points radially outward. The force per unit length along the circumference on a single wire is fr/n = Fr/(n2πR) = I2nμ0/2. (c) Consider a wire loop acted on by a radial force. The magnitude of force per unit length is constant. If the loop is cut into two equal pieces, then the total force pulling the pieces apart is Fz = 2*(I2nμ0/2)∫0π/2cosθ rdθ = I2nμ0r. For the two pieces of the loop to not accelerate away from each other we need 2T = Fz, where T is the tension in the wire. A rectangular loop consists of N closely wrapped turns and has dimensions a = 0.4 m and b = 0.3 m. The loop is hinged along the y-axis and its plane makes an angle of 30o with the x-axis. What is the magnitude of the torque exerted on the loop by a uniform magnetic field B = 0.8 T directed along the x-axis when the current I is 1.2 A in the direction shown? What is the expected direction of rotation of the loop? We are asked to find the torque on a current loop. The torque on a dipole is τ = μ x B. The torque exerted on the loop is τ = μ x B. The magnetic moment is the magnetic moment per turn, times the number of turns, μ = NabI. The direction of μ makes an angle of 60o with the x-axis and an angle of 150o with the z-axis. The smallest angle between μ and B is 60o. τ = NabIBsin60o = 100(0.4)(0.3)(1.2)(0.8)(0.866) Nm = 9.98 Nm. Assume a system has a magnetic dipole moment m because it has orbital angular momentum L. If the dipole is at an angle θ to a uniform magnetic field B, find the precession frequency Ω in terms of L/m. A sphere with magnetic dipole moment m and moment of inertia I about an axis through its center is placed in a uniform magnetic field B. Find the period of small oscillations of the dipole. Let B point in the z-direction and μ make an angle θ with the z-axis. Therefore the period T = 2π(I/(μB))½. A loop of wire is shaped like a regular plane polygon of 2n sides. The distance between parallel sides is 2a. The loop carries a current I. The loop is placed in a uniform magnetic field B. Find the magnitude torque on the loop. How does it depend on the direction of B? We are asked to find the magnitude of the torque on a current loop. The torque on a current is τ = μ x B. The magnetic moment is μ = IAn. (Only the area of the loop, not the shape, matters.) The direction n of μ is given by the right hand rule. For the loop placed as shown and the current flowing counterclockwise, μ points out of the page. The area of the loop is A = 2na2tan(π/(2n)). τ = IAsinθ = I2na2tan(π/(2n))sinθ, where θ is the angle between the directions of μ and B. A metal wire of length L is formed into a loop, either square or circular. A current I flows through the loop and it is placed in a uniform magnetic field. Which loop shape results in a larger torque? Why? The torque on a current is τ = μ x B. The magnetic moment is μ = IAn. (Only the area of the loop, not the shape, matters.) The direction n of μ is given by the right hand rule. The magnitude of the torque is τ = IAsinθ, where θ is the angle between the directions of μ and B. For a given length of wire L, the area of the circular loop is L2/(4π) and the area of the square loop is L2/16. For a given θ, the torque on the circular loop is larger.